World 1-4 is the fourth course of World 1 in Super Mario 3D Land. It is an athletic course, and its gimmick is controlling a platform that moves forward or backward depending on where the player stands. This level can be accessed by collecting 3 Star Medals. The course's icon is a Switchboard circling a rock spire with some blocks above it. Mario starts on the land with a Switchboard. Mario must go up on this platform and move it ahead. In the way, there are a ? Block, Coins, Paragoombas, a water geyser and some Brick Blocks. The trail ends in a mountain with the Checkpoint Flag. Another Switchboard must be used briefly to reach in another, dodging fireballs from a Fire Piranha Plant. The last Switchboard takes Mario to a mountain with ? Blocks and a Mystery Box. Soon after, there are some water geysers. The last two are for launching the Switchboard to far below rails that take Mario to a Warp Pipe. The Warp Pipe connects this area to the end of the level, where Mario can use one of these platforms to grab the top of the Goal Pole. Star Medal 1: At the end of the top path after riding the green platform. Star Medal 2: After the checkpoint, in a small inlet after the green platform drops down. Star Medal 3: On a green platform after the Mystery Box near the gushing stream of water. 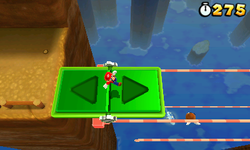 This level, along with other athletic levels in the game, play a remix of the athletic theme from Super Mario Bros. 3.